Prestonlinks Colliery Band was originally founded in 1918 immediately after WWI. It took these First members two years to build the band to the maximum number of 25 brass and 2 percussion. The nine founder members were: Alex Thomson (Baritone), Ian Hay Sr (Cornet), Ian Hay Jr (Cornet). George Baillie (Cornet). Alex Stewart, Special Constable (Cornet). J Grundison (Bass Trombone). William Shepherd (B Flat Bass). J Crawford (Euphonium). They rehearsed in the Blacksmith's shop behind the Forth Garage and grocery' shop at Cockenzie and went on to become the Prestonlinks Colliery Brass Band. registered as a full band on I September 1921. The fundamental aim of the band was to provide light relief to the members from their arduous task down [he mine and so. under the baton of James Jardine and John Hay (assistant conductor), they look the First steps to what has been a very colourful seventy nine years. A constitution and rule book was drawn up and each member had to pay the sum of 3d (1 1/2 p) per week to help the band's Finances, a custom which endures to the present day. In the following years, the band gradually began to play an active part in the social events held wilhin the community, including every Gala Day until 1954. It was about this time that the band was faced with closure unless someone could be found to conduct them. Luckily. Jim Fleming from Musselburgh who had been a boy member became conductor and. by recruiting and training youngsters, gradually rebuilt the band. In 1962 Prestonlinks Colliery closed and for the next two years the band played under the name of Prestonpans and District Miners until the miners at Monktonhall Colliery took them under their wing with financial sponsorship. With backing they went from strength to strength - new uniforms, and in 1966 promotion from 4th to 3rd Section and a place in the National Finals in London. Over the next fourteen years steady progress was made. New instruments were purchased between 1975-80 at a cost of £25,000. boosting morale and improving the sound. Many successcs were registered. Scottish euphonium champion. Area Solo and Quartette champions in 1980 with promotion to the 2nd Section. The early eighties were a golden period when a major prize came their way at even contest they attended. By 1984 they were Scotland's Band of the Year. but from this year on things went into decline. As the workforce at the pit dwindled so did the financial sponsorship and the band was forced to survive on the subscriptions of its members. Things went from bad to worse, at one time only ten members were left out of the usual thirty five. This malady was not common to Prestonpans only but to many other bands throughout Britain. Another band in the area facing similar problems was Dalkeith Burgh Band and. 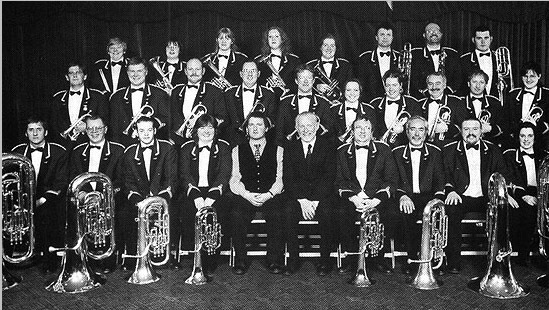 in 1987. in order to survive, the two bands amalgamated to be known as Dalkeith and Monktonhall Colliery band. In 1992. the band secured the sendees of a new Director of Music. AIan Fernie. the well-known composer and arranger and within a few weeks had won a prize at the Mineworkers Contest in Blackpool, a feat he repeated annually for the next five years. In Scotland too honours and promotion came the band's way. At the Scottish Championships in February 1996 they were awarded I st place in the 1st Section and gained promotion to the Championship Section. In the present time they arc one of the top ten bands in Scotland. The band still continues to play a large part in the local community and boasts a close link with founder-member George Baillie, namely his son Bill who plays solo euphonium and has been a key player for 46 years making him the longest serving member, and Joanne Burns who. like her grandfather George, plays cornet and has been with the band for 12 years. So the music goes on into the 21st Century bringing with it new challenges and high hopes for the band's future in its eightieth year.to march off in the year 2000 with the - "Star of the East Flute Band".